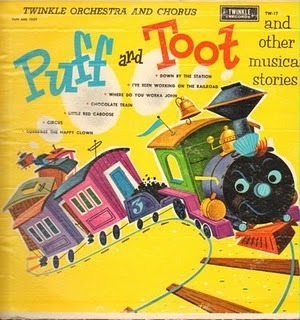 Way Out Wednesday: The Twinkle Orchestra and Chorus - "Puff and Toot and Other Musical Stories"
I’m back with another classic from the Way Out Junk archives, this one featuring the story of Puff and Toot, along with other songs and stories about trains as well as circuses (because why not?). This was most likely gathered from a number of sources although, if that was the case, you’d think they’d be able to find enough songs about trains to fill up a record on its own without tossing circuses into the mix. But who am I to argue with the Twinkle Orchestra and Chorus? We’ll start with the story of Puff and Toot himself. P&T was a train whose mission was to take the children riding inside him to camp. He chugs along as the animals all say hello to him, but is stopped by a cow sitting on the tracks, apparently so she can sing a solo. He asks her to move (or would that be to “MOOOVE”? ), which she does, thankfully avoiding P&T having to give an explanation of how ground round is made. Then a couple of men stop him to inform him that the track ahead was washed out due to a storm. He’s told there’s an old track that runs up a steep and dangerous mountain, but that Puff and Toot would be too small to make it up there. So the wise train finds a safe place for the children to stay until the track is safe, right? Heck no! Screw these kids, he’s gonna make it up that mountain! Will he? SPOILER ALERT: yes. Any album of train songs wouldn’t be worth its salt if it didn’t include “I’ve Been Working on the Railroad,” and this record follows suit with this good solid rendition. I wonder how many people these days even remember all the verses to that song. Well, if you forgot, here’s your chance to learn them again. Moving along to the circus portion, here’s a little song about a happy little clown named Squeegee, and it’s just as cheerfully annoying as your average clown! Going back to our original motif, we have “Chocolate Rain.” Wait, make that “Chocolate Train” (although I don’t know if that’s much better)! And just to make sure we don’t get any smart remarks here, we have Mighty Mouse making a guest appearance! Hi there, the jolly conductor of Twinkle Records tells us that he is all set to take us on an imaginative trip to adventure land with Puff & Toot. We can’t wait . . . First we’ll ride the Red Caboose and we’ll see Squeegie the Clown and stop Down By The Station. But Oh then . . . we can ride the Chocolate Train . . . isn’t that exciting? Just think a Chocolate Train all for us. I can’t wait can you. Well climb on cause here we go…”ALL ABOARD”. Pretty convincing, huh? If you’d like to hear the rest of this album (which really is better than the above quote would have you believe), you can find it here.